A collaborative of Russian researchers has mathematically modelled diamond-based microstructures for producing compact, high-sensitivity sensors. The study investigates the problem of selecting a useful acoustic signal taking into account the excitation of Lamb waves in promising microwave microresonators with substrates of synthetic diamonds. 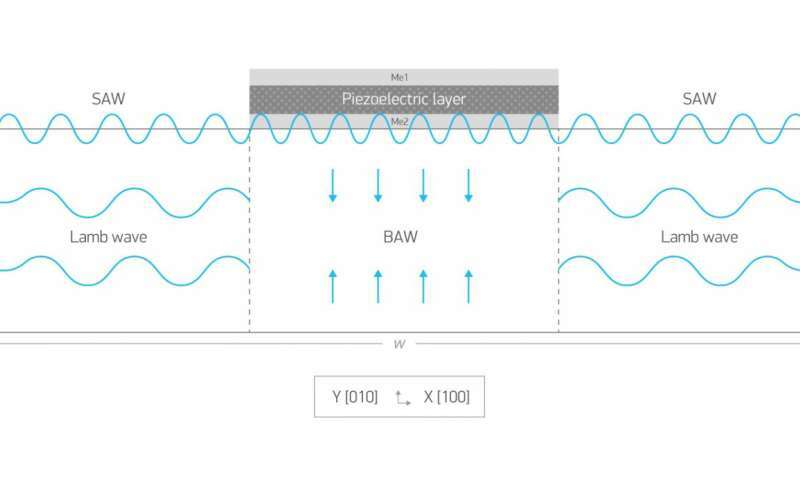 The scientists proposed a mathematical model and experimentally studied acoustic waves in the piezoelectric layered structure, described their dispersion and proposed a number of ways to decrease the effects of spurious peaks. In the future, diamond crystal-based structures may be used as high sensitivity sensors to detect pressure, acceleration, temperature and the thickness of ultrathin films. The paper has been published in Applied Physics Letters. "I think that the results we have obtained from a piezoelectric layered structure based on synthetic diamonds are ahead of world-class research in this field. Our microresonators were used to obtain resonances at record high microwave frequencies in a range of up to 20 GHz, with the quality factor remaining at several thousand. The behaviour of diamond as a substrate for the acoustic microresonator was very significant and I hope that using diamonds in acoustics and electronics will lead to more exciting discoveries," said the corresponding author of the study, Boris Sorokin, in an interview with MIPT's Communications Office. The quality factor is a feature of an oscillating system. It describes how quickly oscillations die down in a system; the higher the quality factor, the smaller the energy loss. A piezoelectric layered structure is a "sandwich" of various materials with a piezoelectric effect. This term means that under compression or tension, an electric field occurs around the material—and when an electrical voltage is applied, the material itself changes shape. Non-scientists have seen the piezoelectric effect in lighters, which have piezoelectrics that provide enough voltage for a spark. The effect is also used in microphones, precise micromanipulators, and many kinds of sensors for pressure, humidity and temperature. Another important application of piezoelectrics is in highly stable piezoelectric resonators, which enable quartz clocks to display time accurately and computers to run programs smoothly. The effect of an electric field on a piezoelectric, in this case a thin film of aluminium nitride AlN, leads to deformation and causes elastic waves that pass to the substrate in the same way that an elastic wave falling on the piezoelectric film causes an electric field. When it reaches the edge of the substrate, the wave is reflected and within the layers of several materials, a number of oscillations occur at the same time—this effect resembles a sonic echo that can be heard when shouting in a tunnel or into a wide tube. Diamond substrates were not chosen by chance. Piezocrystals are ideal for such devices, as they have a combination of properties such as low acoustic absorption, a high electromechanical coupling coefficient, and a high speed of sound. Diamonds satisfy all these requirements except for one—there is no piezoelectric effect. This is why the devices require the aluminium nitride film. Engineers are, of course, slightly apprehensive regarding the price, but synthetic diamonds are now becoming more affordable. The properties of synthetic diamonds are superior to those observed in natural diamonds, particularly in terms of their impurity profile and reproducibility. The authors of the study believe that synthetic single crystal diamonds are most promising for developing new acoustoelectric devices. Voluminous waves excited in the layered structure can resonate, creating both the basic type (mode) of oscillations, and also generating additional modes. In the substrate and piezoelectric film, in addition to the useful longitudinal-type oscillations, Lamb waves also occur under certain conditions. The spectrum of these waves is in separate branches with the phase velocity dependent on the frequency. Lamb waves are a complex combination of elastic oscillations occurring in thin layers of elastic media and were first described by the British physicist Horace Lamb. Interestingly, the particles in these waves follow an elliptical path. There are symmetric and antisymmetric (bending) Lamb waves. Phase velocity is the velocity at which a point moves from a predetermined phase—e.g., the crest of a wave. The phase velocity of waves in a particular medium often depends on their frequency, and this effect is called dispersion. In this case, it is geometric dispersion of waves in two-dimensional acoustic waveguides. On the one hand, excitation of Lamb waves is not useful in terms of the quality factor of the acoustic resonator in the main (longitudinal) mode, however these types of waves themselves may be of special interest. Using mathematical modelling, researchers studied in detail the spectrum of various acoustic modes occurring within the diamond structure, using a visualization of the areas of acoustic displacement. They paid particular attention to resonances that occur as a result of a whole spectrum of natural oscillation frequencies in the layered "sandwich." In the simplest case, this frequency corresponds to the frequency at which an elastic system would oscillate in the absence of external influences. Touching and releasing an ordinary pendulum, for example, causes it to swing with a natural frequency, and applying force with this frequency is most effective for its swing. Resonance is when the natural frequency and the excitation frequency coincide—the oscillation amplitude increases sharply. Natural frequencies depend on the properties of the materials, as well as the geometry of the structure. This means that detectors can be made to detect even individual bacteria that have become attached to the surface—the bacteria slightly increase the mass of the entire system and shift the resonant frequency. One of the main results was that the researchers could select and identify different types of waves and form dispersion laws for them. The results will be useful in the development of microwave acoustoelectronic devices. Acoustoelectronics is a science combining solid-state physics, semiconductors and radioelectronics that studies the principles of building devices to detect, convert, and process signals. Acoustic resonators are widely used in science and technology as sensing elements in various physical and chemical sensors and in medical devices. Cavity resonators are popular because of their miniature size and high quality, while resonating at high and ultra-high frequencies. The higher the operating frequencies, the smaller the cross-sectional dimensions of resonators are required (~100 microns for a frequency of ~10 GHz).